Axe with a thin, long and straight knife-ground edge, hand-forged and made from Swedish axe steel using traditional methods in use since 1697. 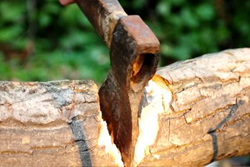 The steel is stuck several times, increasing its density and thereby the durability of the axe. Has a notch in the head near the shaft, allowing you to hold a hand directly above the edge while cutting.